After acquiring de Havilland Canada’s aircraft programmes, Canada’s Viking Air has now acquired rights to Bombardier’s series of water bomber aircraft. Viking Air Limited on 20 June announced the acquisition of the worldwide amphibious aircraft programme from Bombardier. 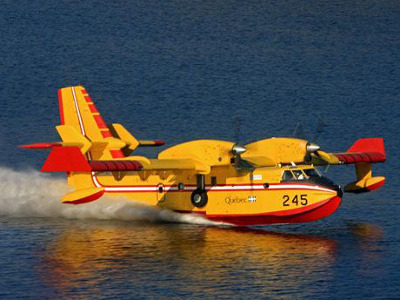 The amphibious aircraft program includes the Bombardier CL-415 water bomber and its variants, as well as the earlier CL-215 and CL-215T versions. The Bombardier 415 is the only western aircraft purpose-built for firefighting. The transaction will see Viking acquire the Type Certificates (manufacturing rights) for all variants of Bombardier’s amphibious aircraft, and assume responsibility for product support, parts and service for the fleet of some 170 waterbombers in service with 21 operators in 11 countries around the world. No amphibious aircraft have been produced since December 2015 after Bombardier paused the programme. Bombardier’s amphibious aircraft are emblematic of Canada and are the backbone of many firefighting operations around the world, Bombardier said. The Bombardier 415 was launched in 1994 and drew on the success of the earlier CL-215 and CL-215T versions. Close to 170 Bombardier amphibious aircraft are in service worldwide. Viking Air said this follows its successful model of acquiring, supporting and sustaining utility aircraft programmes, including manufacturing the Twin Otter Series 400 aircraft. Viking will support the worldwide amphibious aircraft programme from a newly acquired and specially repurposed 50,000 square foot facility in Calgary. In 2006 Viking acquired the Original Type Certificates (manufacturing rights) for all out-of-production de Havilland aircraft from the DHC-1 Chipmunk through to the DASH-7 50 passenger STOL regional airliner. In 2007 Viking launched the Twin Otter Series 400 production program, and to date over 100 aircraft have been sold to 29 countries worldwide. A current production rate averages one new aircraft delivered every 15 business days.